The 1935 opening night of Clifford Odets’s “Waiting for Lefty” is one of the great stories of the American theatre. It was the play that put the Group Theatre on the theatrical map. Founded by Harold Clurman, Cheryl Crawford, and Lee Strasburg and including Stella Adler and Sandy Meisner among its members, the Group was revolutionary in its day and still remains a force to be reckoned with. Inspired by left wing politics of the time, the Group set out to create an egalitarian workers theatre, without stars and focussing on ensemble acting, presenting plays appropriate for an audience of workers. Several of the 20th century’s most influential acting teachers and actors were members. The play and the excitement it generated is legendary, and any revival carries with it an enomous weight of history. Ubuntu Theater Project’s revival offers considerable excitement of its own. Staged in a car dealership that features antique cars from the 1930s, it effectively moves the audience back in time t0 the era of the Great Depression. The cries of “Strike” are galvanizing, as they need to be. The political content is as contemporary as yesterday’s headlines, at a time when exploitation of workers, the decline of union power, and the realities of income disparities and discrimination against immigrants are capturing the attention of the electorate. Still, “Waiting for Lefty” remains a period piece, in period costume, and its language — though richly poetic (Odets was a marvelous wordsmith) — often seems strained and dated. This production is at its best when it effectively incorporates song and during the group scenes when the workers are galvanized to call for the strike. The other more intimate scenes — a series of vignettes with barely disguised political content — are played in a straight forward fashion that presents the story and arguments effectively, but sometimes lacks an emotional depth and subtlety that might have been achieved in the hands of more experienced actors. Audience members who have heard of this very famous play will be enlightened and excited by this revival, and will certainly get what all the excitement was about. At a brisk 80 minutes (without intermission), and staged in a very unusual and stimulating venue, “Waiting for Lefty” makes for an unusual and satisfying night of theatre. Ubuntu Theatre is planning a full season for 2015-2016, and the Bay area theatre community should be watching with interest to see what comes. “Waiting for Lefty” plays at Classic Cars West in Oakland through September 12, 2015. For further information click here. 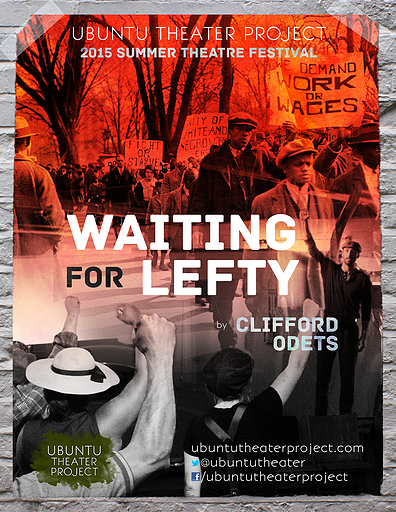 “Waiting for Lefty” by Clifford Odets, produced by Ubuntu Theater Project. Directors: Emilie Whelan + Michael Socrates Moran. Lighting: Stephanie Anne Johnson. Costumes: Luther Spratt. Ensemble: Anjelia Diaz. Dr. Barnes: Ariel Luckey. Florrie: Britney Frazier. Fayette: Colin Blattel. Ensemble: Dashea Wynne. Tom Clayton: EJ Gibson. Edna: Emilie Whelan. Miller: Francisco Arcila. Ensemble: Jesse Noily. Ensemble: Julian Mark. Fatt: MacGregor Arney. Sid: Michael Socrates Moran. Ensemble: Ronlanda Bell. A Woman: Sarita Ocon. Agate: Sean McIntyre. Joe: Terrance White. Dr. Benjamin: Tim Barnett. Irv: William H. P. Gunman: William Oliver. Posted in Reviews.Tagged Charles Kruger, Clifford Odets, Emile Whelan, Group Theater, MIchael Socrates Moran, san freancisco theater reviews, theatrestorm, Ubuntu Theatre Project, Waiting for Lefty.